Cooked rhubarb was one of my mother’s favorite foods, and she’d often serve it as a dessert in winter time with vanilla ice cream. This particular recipe comes all the way from Wyoming, and will furnish you with one of the tastiest pies you’ll ever wrap your lips around. 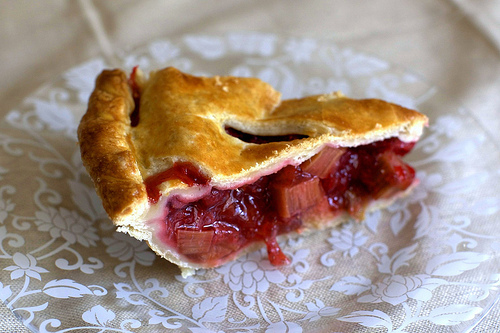 You’ll find this pie refreshing in that it’s not overly sweet, in fact, the rhubarb makes it a little tart. If you think this wouldn’t be something you’d enjoy, dial the white sugar up to 3/4 cup. Pie should keep for up to three days at room temperature but I have never, ever seen one last that long.